Self-driving cars have to be easy if they're going to catch on. Yes, they have to be safe, but they also need to be approachable. Tony Fadell – the creator of the Nest thermostat and one of the guys behind the iPod and iPhone – might be the man to make that happen. The big tech news last week was the death of the Google Glass Explorer edition, which was both awkward and creepy and made otherwise perfectly decent human beings into sociopaths. But it didn't really die, it just moved on. Glass was pulled from Google X – the company's skunkworks division – and handed to Fadell in an attempt to refine it for sales beyond wannabe-cyborgs. If you don't know Fadell, you know his work. He designed the first iPod in 2001, eventually headed up Apple's music player division, and helped create the iPhone. He left Apple in 2008 and went on to found Nest, which makes sleek, net-connected thermostats and carbon monoxide detectors that are becoming mainstays of the smart home. Two years after putting its first product on the market, Nest was acquired by Google for $3.2 billion, and now Fadell is playing a key roll in trying to make Google's data-centric consumer products as slick as the crew from Cupertino's. With Glass "graduating" from Google's experimental projects incubator, it's now part of its own division and the project's head is reporting to Fadell. But it's probably just the first project to move from Google X and into Fadell's hands. 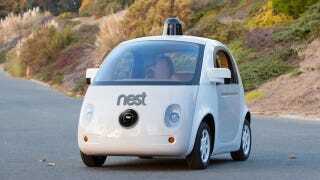 "There may be some Google X products that could become a part of Nest when they graduate," Rogers says. That pretty much happened with Glass and there's a good chance that Google's self-driving car – still part of Google X – could be another project Fadell will work on. That's still quite a ways out – at least five years to 10 years – but if there's anyone inside Google that could make its self-driving project more palatable, it's Fadell. With Nest, he focused on the "unloved" gadgets of the world, without veering into Brookstone/Sharper Image/SkyMall territory. With autonomous cars, Fadell and his team could take the lessons learned at Apple to create a self-driving car – or the interface to use it – that's smart, elegant, and accessible. Fadell has dismissed rumors of taking over Google's consumer products – Android in particular – saying that he's focused on creating products for Nest, not Google, and simply doesn't have the time. That's obviously beginning to shift with his new role overseeing Glass, and he admitted that his focus is sure to change over time. "I'm not about to go muck with things over [at Google] — that's not my role," Fadell told Fast Company. "But is it going to be like that in 10 years? I have no idea." Ten years sounds about right.